Most marshmallow recipes for the home cook are strikingly similar not just in their ingredients but in their proportions. 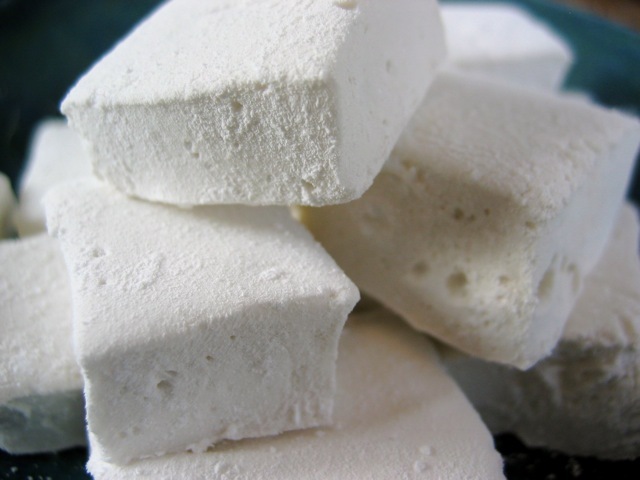 You can make your mallows sweeter (tooth-achingly so, if you like) or flavored (see Variations, below), but the basics are not going to change much. In case you were wondering why marshmallows are called just that, it's because the traditional thickening agent (before gelatin took over) for this confection came from a mallow plant that, yes, grows in marshes. Grease the bottom and sides of a 9-by-9-inch square baking pan. (If you want thinner marshmallows, use a 13-by-9-by-2-inch pan, but keep in mind that freshly made marshmallow goo is about the messiest gunk around, and spreading it out to fill the bigger pan can be frustrating.) Dust the pan with a solid, even layer of confectioners' sugar (about ⅛ cup sugar). In a large bowl or in the bowl of a stand mixer, pour ½ cup of the water. Carefully sprinkle the gelatin over the water so that all of the powdered gelatin is moistened. In a heavy-bottomed saucepan, stir together the remaining ½ cup water, the 1½ cups sugar, the corn syrup, and the salt. Stir over low heat until the sugar has dissolved, then raise the heat to high and bring the mixture to a boil. Lower the heat just a bit for an even boil and cook, without stirring, until the mixture reaches 240 degrees on a candy thermometer (about 12 to 15 minutes). Remove from the heat. Pour the boiling syrup over the moistened gelatin. If using a stand mixer, turn the machine on to quickly mix the hot syrup with the gelatin; if using just a bowl, stir quickly to dissolve the gelatin into the syrup. Add the vanilla, if using, then beat on high speed with the stand mixer or a handheld electric mixer until the mixture is white and thick (about 6 minutes with the stand mixer or 10 to 15 minutes with the handheld mixer). Halfway through the beating time, the marshmallow goo will become thick enough to start climbing up the beaters; you'll need to scrape the beaters down as you go. Prep your scraper (spatula, knife, etc.) by greasing it with butter or oil, otherwise the mallow with simply stick to it. With a freshly greased spatula, scrape the thickened mallow fluff into the prepared pan and spread it (if you can) to an even thickness. Dust across the top with another ⅛ cup or so of confectioners' sugar. Let sit, uncovered, until cool and firm, at least a few hours and preferably overnight. Excess sugar should've fallen off the slab into the pan when you removed it; if you need more, dust another ⅛ cup of confectioners' sugar into the pan. Roll the strips of mallow in the sugar to coat the newly exposed surfaces, then snip the strips into 1-inch squares. Dust these in the sugar and brush off the excess. Store in an airtight container for up to 1 week. Serve plain, with s'mores, on Banana Boats, or in homemade hot chocolate. Variations: Swap out the vanilla extract for a different flavored extract: peppermint, maple, lemon, etc. You can also sprinkle the top of the freshly spread batter with a dry flavoring, such as toasted shredded coconut, cinnamon and sugar, or minced nuts. Some recipes — versions by David Lebovitz and Gourmet, for example — call for whipped egg whites, which makes the marshmallows lighter and fluffier. And if you really can't stand the idea of eating anything made with corn syrup, try Clotilde Dusoulier's flavored guimauve (that's French for marshmallow) instead.